In the past, we had discussed BER for BPSK in flat fading Rayleigh channel. 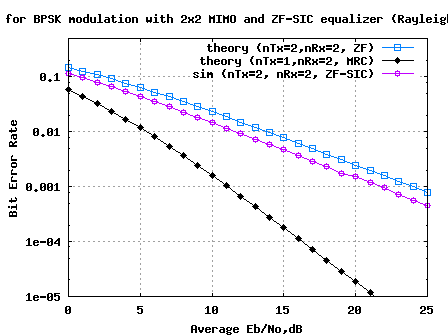 In this post, lets discuss a frequency selective channel with the use of Zero Forcing (ZF) equalization to compensate for the inter symbol interference (ISI). For simplifying the discussion, we will assume that there is no pulse shaping at the transmitter. The ISI channel is assumed to be a fixed 3 tap channel. For simplicity, lets assume that the transmit pulse shaping filter is not present, i.e . Lets us assume the channel to be a 3 tap multipath channel with spacing i.e. Objective of Zero Forcing Equalization is to find a set of filter coefficients which can make . The term causes noise amplification resulting poorer bit error rate performance. From the post on toeplitz matrix,we know that convolution operation can be represented as matrix multiplication. (c) Convolving the symbols with a 3-tap fixed fading channel. 1. Increasing the equalizer tap length from 3 to 5 showed reasonable performance improvement. 2. Diminishing returns from improving the equalizer tap length above 5. 3. The results are poorer compared to the AWGN no multipath results. This is due to the noise amplification (see the frequency response above) by the zero forcing equalization filter. Next step is to discuss the zero forcing equalizer in the presence of transmit pulse shaping and then move on to minimum mean square error equalizer. i m doing a project on interference mitigation in UWB channel. I hav choose transmitted reference receiver to mitigate interference. hav not able to model the channel..:-( m i proceeding in a right way?? @chayanika: For modeling the channel, one can start of with a simple AWGN noise model and later one can add multipath to it. For modeling interference, one need to idea of how is interfering – Is it another UWB transmitter operating in the same frequency? realllllllllllllllly Very nice work sir!! can you help me for use that in mimo channel (alamouti method)? @Amire: Typically, when dealing with MIMO channel (especially using OFDM), it is a convolution in the time domain. 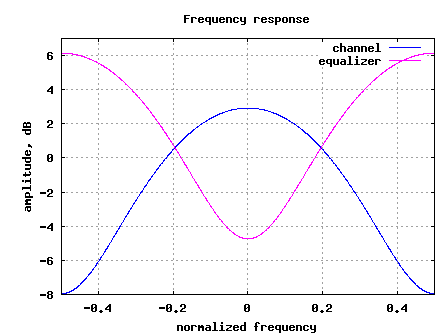 However, assuming that the channel is contained with in the cyclic prefix, the effect of channel in frequency domain is a single mutliplier with amplitude/phase values. My question is related to MF part. at the receiver the MF would be matched to (g(t)*h(t)) followed by a sampler and LE. can you plz explain this. Thanks for pointing that out. In this simulation, have not used any pulse shaping. The code which has the comment stating it is matched filtering is indeed doing the equalization part. Another comment which I have is : if we have inter symbol interference, then it is preferable to do equalization first and then do the matched filtering. Agree? @Sylva: The kk+2 is to ignore the first few samples caused by the delay of the filter. Do you have the theoritical BER for zero forcing equalization and MMSE equalization? Can you explain a little bit more about the ‘Matched Filter’ part? Could you please let me know the purpose of this step? Why are we performing convolution with 1 at the receiver? @Siva: The last two line may have been inherited from existing code which had pulse shaping in the transmitter. Sorry about that. Thank you a lot all are really help full! @Fantaye: Guess, you want to use LMS for channel tracking? 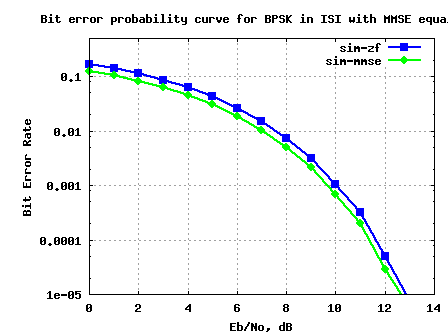 For a MIMO system, how do I model an ISI channel? Meaning do I sum the impulse responses for the various paths from antenna i to antenna j and denote it as a single co efficient in the H matrix as h(ji)? And so how do I perform ZF-SIC for the same case? @vsk: In a MIMO ISI case, convolve each transmit stream with the channel seen from each transmit stream to receive antenna. and x1, x2 are transmit symbols from antenna 1 and 2 respectively. Do NOT sum all the impulse response and represent them as a single value. Hi i have a question regarding the ZF-equlization, what if the desired tap is at the last position? h = [0.3 0.1 0.9]. I tried to change the code but i could not. 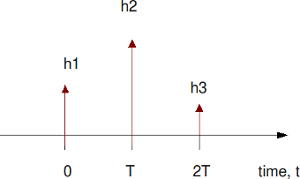 when we perform convolution one of the signals is flipped at t=0. so the convolution matrix should look like the second matrix. kindly let me know what point i m missing here. @mepal: the end goal is to make conv(c,ht) = impulse. we want to make the cascade of channel and equalizer equivalent to a single impulse(incase of ZF LE). How is this different from Partial Response Target Equalization (PRTE). In PRTE one defines a target and derive optimal equalizer by minimizing MSE. So there is an optimality criterion involved in the derivation of PTRE but apart from that we desire to have the conv(c,ht)=target . Can we comment that MMSE LE is same as PTRE (both r derived based on minimizing MSE)? Is the above observation correct? Thank you for ur post, that is help me so much. That is time invariant channel??? One question about the channel coeffecients. They are real number as I we find here. But in case of Rayleigh channel they are complex where both real are imaginary parts are samples from Gaussain distribution. My question is if we consider a static ISI channel with complex coeffcients, is there anything wrong with it?Since the co-efficients refer to the gain of each tap, I feel complex values are also possible where the imaginary parts refers to the phase. Request you to please explain the below mentioned part of your code. K=4; What is the significance of this K and why is it equal to 4? Can we not perform the above operations using just conv or filter functions in Matlab? K = 4 equalizers. Inside the loop, the length of the equalizer is chosen by 2*kk+1, where kk = 1:4 (3,5,7,9). hello, Krishna Sankar, I have a question on ZF for ISI channel. Why it’s different from your derivation results. Can you tell where I’m wrong. @Andrew: Its a convolution operation. When I saw some old posts, many red “X” appear where the formula or symbol should be. How can I solve it ? Is something wrong with my browser? @rajesh: Can you please list the posts where you saw this error. This is not expected. Anyhow once you give the list, I will take a look. Why does the division factor equal to 20 ? 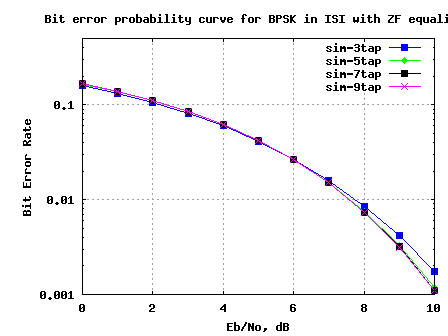 @Puripong: We want to convert scale the noise voltage by a factor corresponding to Eb_N0_dB. To convert dB to voltage we have the 1/20 term (as you have pointed out in (2)). Helps? We want to convert Eb_N0_dB into noise voltage. @communications_engineer: Thanks. Hope my reply to both the comments addressed some of your concerns. Good luck. Wow~~ New topic, I like it~! @mepal: Hmm… I have not studied the topic PRTE, so can’t really comment. However, your train of thoughts sound reasonable. Previous post: dspLog turns two! Happy Birthday!